“It is a cold Montana winter afternoon,” says artist Z.S. 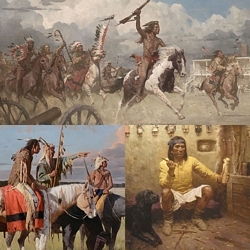 Liang, “and this Piegan war chief has ridden out alone from his encampment to assure the area is secure for his people.” The South Piegan, based in Montana for thousands of years, are part of the Blackfoot Confederacy. Artist Z.S. Liang often recounts that his rural Chinese upbringing was centered on ancient and traditional lifestyles which made it easy for him to relate to the Native Americans. For example, no resources were wasted in his home, much like the Plains Indians who used every part of the buffalo their lives depended on. A long time US resident, Liang has made himself into a student of Native American life, both in his personal library and his time in the field with tribes today. His devotion to historical details, and to the constant improvement of his skills, led him to horseback riding lessons so he could more accurately understand the movement and musculature of the animal that played such an important role in the life of the Plains Indian. "Camp Sentry," a dramatic portrait of Native and horse in the winter sun of Montana, is a consummate example of Liang’s skilled composition. Patterns of light and dark are repeated from the sky, the mountains and the light field of snow, to the rider’s coat and his mount. Note how the headdress just touches the mountain’s horizon, preparing the eye for the spear tip that breaks that line. We can practically feel the chill wind in the brushstrokes on the horse, its tail and the winter grass. This outstanding and rare Liang is a work of fine art that will be treasured in any home.